Add some pure aggression and energy to your heavy and hard and rock productions. These hard rock drum loops for today’s modern hard rock mixes. Drum Werks II: Reloaded serves up only the heaviest rock drum grooves and samples for today’s hard rock music styles. Hard Rock Drums That Will Withstand Any Barrage of Guitar Riffs! Your heavy rock drum tracks need the powerful and relentless grooves showcased in Drum Werks II: Reloaded. This sample library delivers powerful and aggressive hard rock drum loops for today’s modern hard rock mixes. With 100% pounding loop and sample content, you’ll get only the heaviest grooves for multiple hard rock songwriting styles that demand a modern rock drum sound. A high-definition and powerful mix is at the heart of the all-new Drum Werks II:Reloaded. We took the pure hard rocking spirit of the original Drum Werks II and gave it a complete sonic and groove update. Simply put, it’s bigger, louder, and heavier. If you’re writing anything along the lines Breaking Benjamin, Black Label Society, Alter Bridge, Deftones, or My Chemical Romance, these samples have the sound and attitude that will serve your songwriting efforts well. Aggressive and unrelenting powerful hard rock drum tracks are a drag and drop away in the DAW software of your choice, including ProTools, Logic, GarageBand, Cubase, ACID, Ableton Live, Studio One and more. 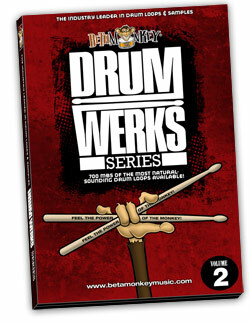 Please Note: Drum Werks II:Reloaded is a drum loops pack only. All demo tracks containing music are for illustration purposes only. With 600 hard rock drum loops covering a wide spectrum of groove styles from 90 bpm to 150 bpm, we have covered the hard rock genre exhaustively with main grooves, half-time and double-time groove variations, and fills. Drum Werks II: Reloaded captures the intense energy and power of hard rock, offering a powerful songwriting tool to create rock drum tracks quickly and easily. This drum loop library will become your go-to songwriting tool for creating the heaviest and loudest hard rock drum tracks. 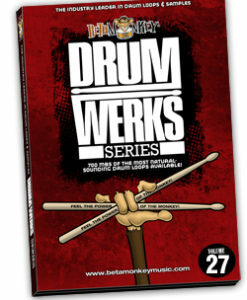 In addition to the loops, Drum Werks II: Reloaded also included a complete matching set of drum samples with 256 MB of drum and cymbal samples. This exclusive Beta Monkey feature allows for further customization and sequencing when/if the need arises. The drum and cymbal samples provides a complete additional resource for artists who prefer to build hard rock tracks from scratch in any virtual instrument. Versatile Hard Rock Grooves and Sounds: Drum Werks II: Reloaded offers a powerful songwriting resource for all rock songwriters looking for a huge, in-your-face drum mix with plenty of natural resonance and room ambience. Aggressive, deep grooves are the key ingredient in this sample library. Drum Werks II: Reloaded delivers the modern rock sounds and grooves the way today’s songwriters need and want them. Cohesive Groove Sets: All loops are taken from a single recording session, all sonically-matched groove sets. All the grooves, groove variations, fills, and one shots will blend and mix easily with anything else on the disc. All loops, samples were recorded with a Tama Maple drum kit in one of the Bay Area’s top recording studios. You get unlimited “mix and match” capabilities with this powerful collection of hard rock beats. Complete Matching Drum Samples: We sampled the entire kit used in the recording sessions and included multi-velocity samples of the drums and cymbals recorded for the Drum Werks II recording sessions. 600 (1 GB as 24-bit loops; 677 MB 16-bit) drum loops available in 16, 24-bit ACIDized WAV, Apple Loop, and REX2 formats. ALL available formats included with purchase. Complete matching set of drum samples taken from this recording session. All recorded drums and cymbals were sampled and included with purchase. Included Drum Loop folders: 90 BPM Rock – 130 loops; 100 BPM Rock – 103 loops; 110 BPM Rock – 97 loops; 125 BPM Rock – 84 loops; 135 BPM Rock – 97 loops; 150 BPM Rock – 89 loops; Drum Samples – 168 single hits of drums and cymbals (256 MB). 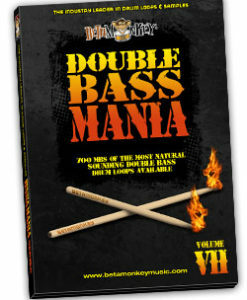 Mix and match these hard rock drum loops with Double Bass Mania VII and Double Bass Mania VIII. Great, real sounding drums. Lots of beats, but you can create more by chopping them up and re-arranging.